The ITC is a Federal tax incentive enacted in 2006 which benefits solar panel installers and homeowners wanting to install solar panels. The ITC provides a 30% Federal tax credit reducing the cost of solar system installation. 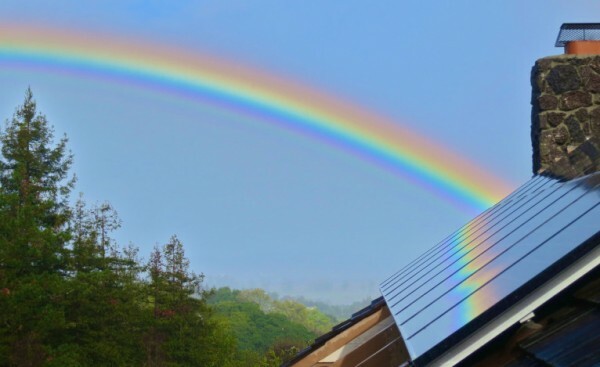 Specifically, the ITC benefits any company which develops, installs, or finances a solar project, as well as homeowners who outright purchase solar systems and have them installed on their home. 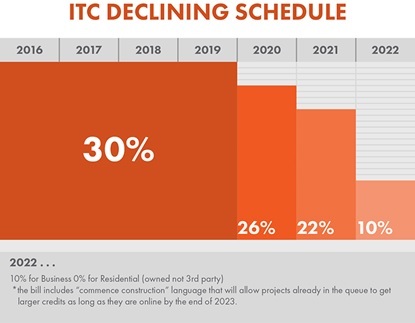 The 30% residential tax credit offered under the ITC was scheduled to elapse on December 31, 2015 and the commercial credit for installers was set to decline to 10%. Failing to extend the ITC would have been detrimental to the solar industry and the economy alike, as we’ve outlined in a previous article on our SolarLeadFactory blog. Had the ITC not been extended, solar projects would have unquestionably seen a steep decline. On December 18, 2015 the Senate voted 65-33 in favor of a $1.15 trillion omnibus spending bill as well as a $629 billion tax bill which partly funds the ITC, thereby extending the ITC. We are ecstatic to see the extension of the ITC – we’re even more pleased to see the extension utilizing a similar step-down framework which we suggested (although take no credit for) as the best option that could have been enacted by Congress for the five year extension of the ITC. The five year extension of the ITC means some form of tax incentive will continue until 2022. Using a step-down framework, the 30% credit will remain intact until 2019 and will then be reduced to 26% in 2020, and further reduced to 22% in 2021. In 2022 the ITC will be reduced to a 10% credit available only to installers – homeowners will no longer be offered the credit which aligns to the the same framework the ITC had previous to the extension. The step-down framework is highlighted by the chart below. Why do we think it’s OK to have the ITC expire? As we discussed in our previous article, there are benefits and innovations, particularly in financing that might be realized in the absence of the ITC. The declining schedule allows for planability, experimentation, and growth of these other models. According to GTM Research more solar panels will be installed annually post ITC extension than what has already been added to the grid cumulatively through 2014 with utility-scale installments increasing the most, with a projected 73% increase through 2020. GTM Research also projects that with low price trends in utility solar sector the ITC extension will result in utility-scale solar contracts less than 4 cents per kilowatt-hour. SEIA and GTM Research have also projected that the solar market will add approximately 72 GW of new capacity between 2016 and 2020, increasing the nation’s solar capacity to over 100 GW – roughly 3.5% percent of all electricity produced in the U.S. Currently the U.S. solar capacity is less than 1% thereby more than tripling the current capacity through the extension of the ITC. Solar sector investment is also expected to rise by $40 billion between 2016 and 2020 ($30 billion annually post 2020), and employment in the solar industry is projected to practically double to approximately 420,000 jobs, based on research conducted by SEIA and GTM Research. While the main burden of the ITC expiration would have been shouldered by utility scale projects, the continued and accelerated residential solar growth is a great sign. Through the solar leads we collect, we can see that there is widespread interest across the country. Hopefully this extension, with the help of some state governments, will enable more people to go solar and more states to become solar champions. The extension of the ITC with the step-down framework allows the industry to make massive headway in expanding the solar market and industry while simultaneously working to achieve greenhouse gas reduction goals. Since the ITC was enacted, solar prices have consistently dropped annually while the rate of installation and panel efficiencies have increased. The five year extension of the ITC with an annual step-down framework is ideal for the success of the solar industry and green energy, and we look forward to the continued growth of solar industry and the economy – all of which will unquestionably be bolstered by the ITC extension. Now maybe in 2018 our Government will pass legislation supporting the growth of energy storage technology?